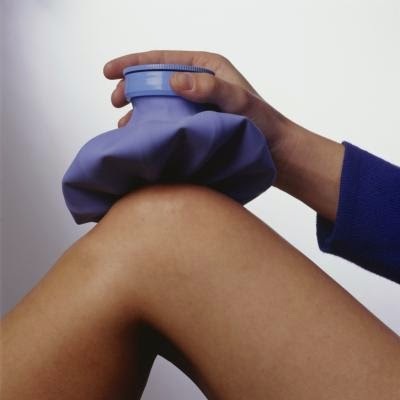 Most people overlook or simply don't give credit to using ice for knee osteoarthritis pain as well as heat therapy. Many arthritis doctors recommend both heat and ice treatments to help reduce inflammation and ease the pain and stiffness that comes with arthritis. It may take a little time to learn which therapy works best for your pain. But don't get discouraged, you will find the right combination of hot packs and ice packs to get the most relief from pain and make it easier to manage arthritis. Cold therapy with ice is the best immediate treatment for acute injuries because it reduces swelling and pain. Ice is a vaso-constrictor (it causes the blood vessels to narrow) and it limits internal bleeding at the injury site. There is controversy as to whether continued application of ice results in a sudden vasodilation of the blood vessels (the hunting response) and if so, at what time this response begins and how often a cycle of constriction and dilation occurs. The best way to ice an injury is with a high quality ice pack that conforms to the body part being iced. The great thing about ice is that you can use it whenever you need it. Apply ice to the painful area for 10 minutes, then remove for 40 minutes. Repeat this cycle as necessary. Heat is generally used for chronic injuries or injuries that have no inflammation or swelling. Sore, stiff, nagging muscle or joint pain is ideal for the use of heat therapy. Athletes with chronic pain or injuries may use heat therapy before exercise to increase the elasticity of joint connective tissues and to stimulate blood flow. Heat can also help relax tight muscles or muscle spasms. Don't apply heat after exercise. After a workout, ice is the better choice on a chronic injury. Morning stiffness or aches after being in one position too long – if you have trouble getting out of bed in the morning because of stiffness, heat can help to loosen you up by bringing blood flow and relaxing the muscles. Heat can also be effective if you have been sitting in the car or at your desk for an extended period. If you are pregnant, you should avoid placing the heat directly on your stomach, and you should be aware of the dangers of raising your core body temperature. Because some injuries can be serious, you should see your doctor if your injury does not improve (or gets worse) within 48 hours.